Article published in The Stentor (Lake Forest College Newspaper) in 1935. The Stentor, Lake Forest College. 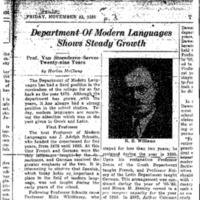 The Stentor, Lake Forest College., “Department of Modern Languages Shows Steady Growth,” Digital Collections - Lake Forest College, accessed April 26, 2019, http://collections.lakeforest.edu/items/show/6285.